Specially designed for easy mounting and free-rolling required in figure-eight cable construction. Quickly mounts to a 3-bolt strand clamp on a pole and allows pulling from pole to pole. Support a single coaxial, fiber optic or copper cable or aerial innerduct up to 2.75" (70 mm) outside diameter. Steel frame, with plastic or aluminum rollers. 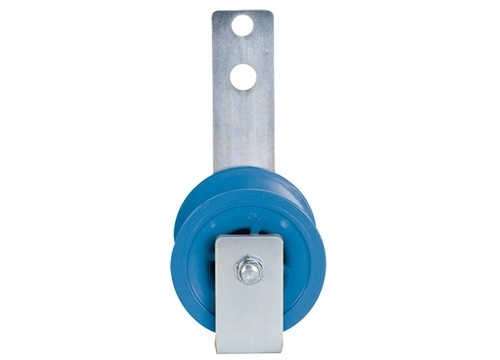 Pole Mount Single Roller Cable Blocks may be equipped with a steel cable retainer to keep the cable or innerduct on the roller, even in low-tension situations. Replacement rollers are also available if necessary.